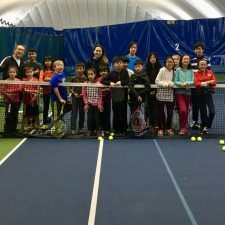 The Doug Philpott Inner City Children’s Tennis Fund in conjunction with The North York Tennis Association (NYTA) and the North York Winter Tennis Club (NYWTC) has been offering free indoor tennis lessons at the North York Winter Tennis Club (adjacent to the Oriole Community Centre – Peanut Plaza). The lessons are available every other Saturday evening from 6 to 8 pm. The winter session began January 6th, 2018 with 10 six to eight year old children and 20 nine to thirteen year old children attending the lessons. 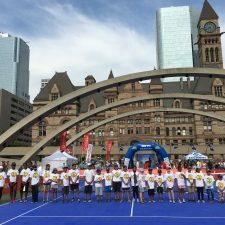 Many children were re-registrants from the fall session and are becoming very proficient tennis players. This program runs until April 14, 2018. 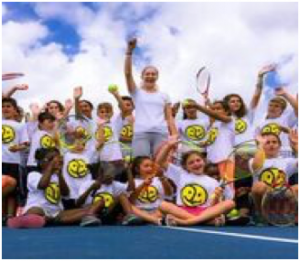 At the conclusion of the program, the children will once again be encouraged to register for the Philpott summer lessons so they can continue to grow their tennis skills and enjoyment. There are volunteer opportunities for youth ages 13 to 15. If you have any interested children or want to volunteer, please email [email protected].